Dallmeier has at its disposal more than 30 years of experience in Video Surveillance Solutions. Inclusive of transmission, recording and picture processing technology, Dallmeier is an outstanding pioneer of CCTV/IP solutions worldwide. This profound knowledge is used in the development of intelligent software and high-quality camera technology, allowing Dallmeier to not only offer stand-alone systems, but also complete network solutions for large projects with perfectly integrated components. From the very beginning, the company has always focused on its own innovative developments, high quality and reliability. This and the extensive experience in the CCTV and IP field have lead to rapid growth and allowed Dallmeier to gain a top position in the international market for video surveillance systems. The wish of every police expert is to maintain an overview of as large an overall situation as possible - at the same time being able to simultaneously observe and solve multiple detail situations. 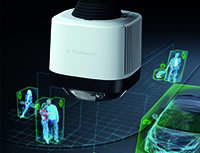 The Panomera® W8 Videosystem, gives a complete 360-degree view of even the most complex situations. While this overview is always maintained and recorded, multiple operators can zoom into the scene at the same time as soon as one or more incidents require attention. In stadiums or e.g. rioting situations, one operator can cover 6-10 times as much area with a fraction of cameras compared to traditional systems. The system is capable of much more: Because of it´s 360 degree view stitched together from 8 individual sensors, the Panomera W8 solution is perfectly suited for a variety of analysis functions, such as reducing the number of false alarms through AI-based pre-selection of relevant events. Panomera® W8 goes even further beyond traditional video technology: Used as a smart optical data sensor, the system provides the ability to extract a wide range of data from complex situations, such as e.g. a traffic junction, without the need for a video image. Institutions thus gain valuable data in order to increase security or to become aware of hazard focal points . Based on „synthetic data“, preventive measures can be planned and correlations observed without touching on any data protection principles. The innovative „Mountera® installation system ensures cost-efficient and flexible implementation.